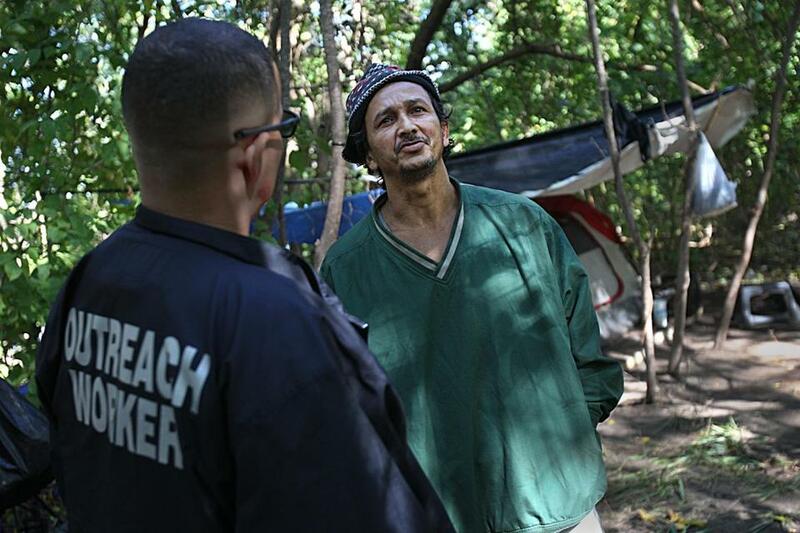 Louie Diaz (left) spoke with Eduardo DeJesus, a homeless man who resides in a tent near other opioid addicts in a Lowell wooded area. LOWELL — An outreach worker and a police officer pick their way, step by careful step, between the crumbling edge of a murky industrial canal and a graffiti-scarred row of rusted railroad cars. This is their outdoor office, a desperate, hidden place where opioid addicts live and die. It’s also a place where outreach worker Louie Diaz and patrolman Kevin Garneau try to bring hope to those without any. Failure is part of the job description. “At times, it seems that there are more people relapsing and dying than getting clean and staying out of jail,” said Diaz, a former heroin addict who spent time in prison. Diaz and Garneau are partners in a Lowell outreach program that seeks out addicts, including the homeless and recent prisoners, in a gritty, street-level effort to turn their lives around by connecting them with treatment and other services. The need is glaring in Lowell. The city has recorded 50 suspected opioid deaths this year, already surpassing the 46 fatalities it totaled in 2015, police said. Persuading addicts to get help is often a Herculean task. Many are leery of shelters and halfway houses, some are avoiding probation officers, and still others are so tethered to heroin that summoning whatever willpower they have left is impossible. “I get discouraged all the time,” Diaz said. Still, Diaz goes out nearly every day, clambering over stacks of corroding pipes or along ridges near the Merrimack River to check on dozens of addicts he knows by name. Garneau is the wiry wingman, and together they do the grunt work that many well-intentioned treatment workers rarely do: meeting homeless addicts in the chaos where they live. They step over exposed needles from used syringes. They pass dozens of discarded alcohol swabs. The tawdry evidence of addiction is never far away. “I don’t give up on them. I call it watering the seed,” said Diaz, a 48-year-old who works for Lowell House, a nonprofit organization that offers addiction services. He, Garneau, and Lowell firefighter Kevin Jones have partnered in the Community Opioid Outreach Program, which has been operating full time for about six months. On a recent day, Diaz and Garneau allowed a reporter and photographer to accompany them on their daily rounds, including a trek down a densely wooded path not far from the University of Massachusetts Lowell. Somewhere in there lived a group of intravenous heroin addicts, and small markers tied around two trees signaled the beginning of a barely discernible trail to their makeshift shelters. At the top of a rise, in a flat space ringed by tents and tarps, the addicts sat in a cluster on plastic chairs. The small group faced a small fire, smoldering in the middle of a warm day, as Diaz and Garneau approached. 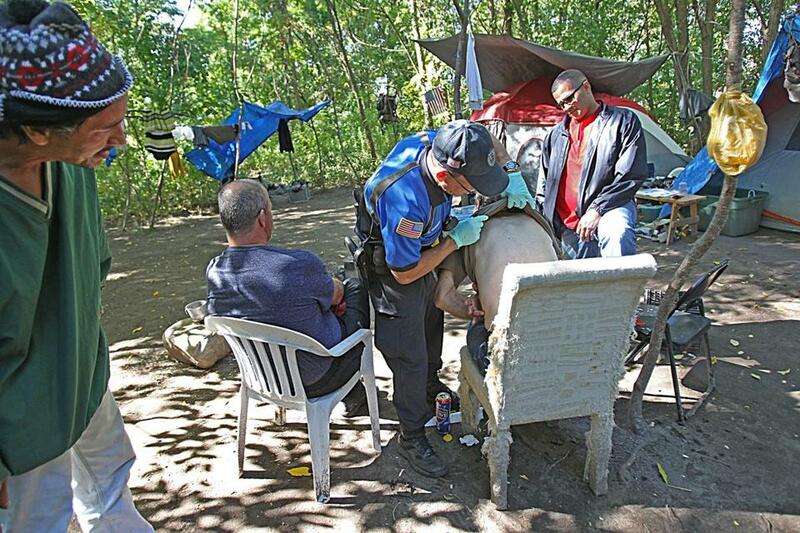 Patrolman Kevin Garneau checked the back of a homeless addicted man for sores and infections in a makeshift camp in Lowell. The pleasantries ended quickly. Jimmy Snow, a 53-year-old, held out his arm and asked if a large sore was infected. Garneau put on a pair of gloves and slowly traced a large area that had become swollen. “Yeah, it’s infected,” Garneau said. “I didn’t think it was,” Snow replied. “You need to go to the hospital for that,” Diaz added. That blend of compassion and firmness is part of a diverse tool kit that Garneau and Diaz pick from. On this day, empathy and advice routinely come first. But Garneau also can seek an involuntary court-ordered commitment if needed. “I’m not going to let someone die out here,” Garneau said. 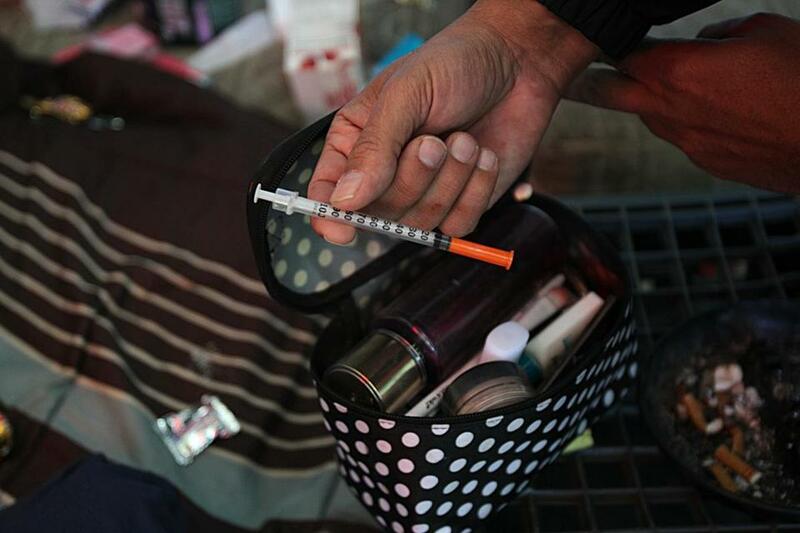 But addicts in Lowell are dying steadily, despite the pair’s efforts. Diaz has stored photos on his smartphone of 44 people who have been killed by opioid overdoses in recent years. There are young people and older victims. Men and women. Many are smiling, apparently happy — if only for a moment. There also is a photo of a middle-aged man, dead in his tent, who had spoken with Diaz only days before. “I know them all,” Diaz said. Diaz tries to head off the worst by working with inmates before their release from the Middlesex House of Correction in Billerica. He talks about temptations they will face and services they can use to stay sober, get on their feet, and find work. Diaz even will show up in the jail’s parking lot and drive a newly released inmate to a halfway house, helping preempt the temptation to revert instantly to bad habits. Diaz’s work at the jail and in the community have been highlighted in “Beyond the Wall,” a documentary film released this year. Diaz looked on last week during a stop at the camp. Many of the addicts are leery of shelters and halfway houses, and some are avoiding probation officers. “Louie has walked in their shoes. He has a master’s degree in life, and they listen a lot more to him than me,” said Sean McAdam, a retired superintendent of the Middlesex House of Correction. The potential for intervention is enormous. About 80 percent of inmates who enter state prison, for example, report that they are addicted — whether to opioids, other drugs, or alcohol, according to Leslie Walker, executive director of Prisoners’ Legal Services, which provides civil legal assistance to Massachusetts inmates. Diaz often struggles with disappointment. “I went to church last night,” he said, “and I was thinking, ‘Is it worth it? Am I making a difference?’ ” But his persuasion and persistence occasionally pay off. As Diaz left the campsite and its dying fire, a voice called after him in Spanish. It was Eduardo DeJesus, a quiet man with an open face who was strung out on heroin. DeJesus had lost weight recently, and he also had forgotten his 52nd birthday the day before. But now, after speaking to Diaz, something clicked. He watched Diaz walk halfway down the slope and followed for a few steps. Diaz heard his voice and turned. “I’ll call you for help,” DeJesus said. An outreach worker found a needle while searching a tent at the camp.